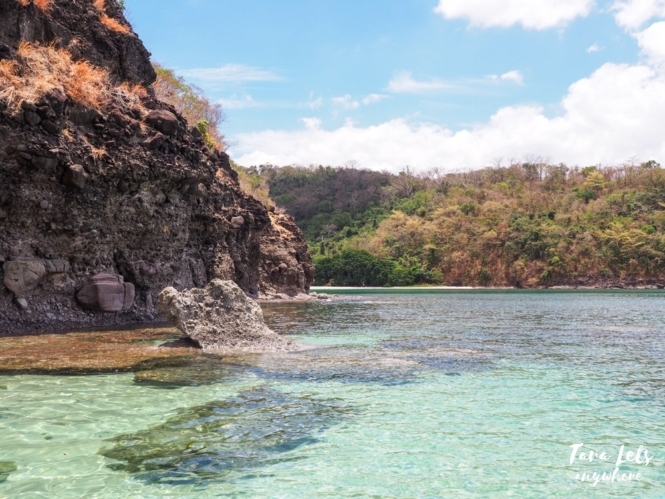 Batangas is our go-to place for budget-friendly beach trips. This summer, I’m lucky to have discovered a new beach destination! I was invited by Biyaheros Travel and Tours in one of their day trips to Papaya Island in Nasugbu, Batangas. 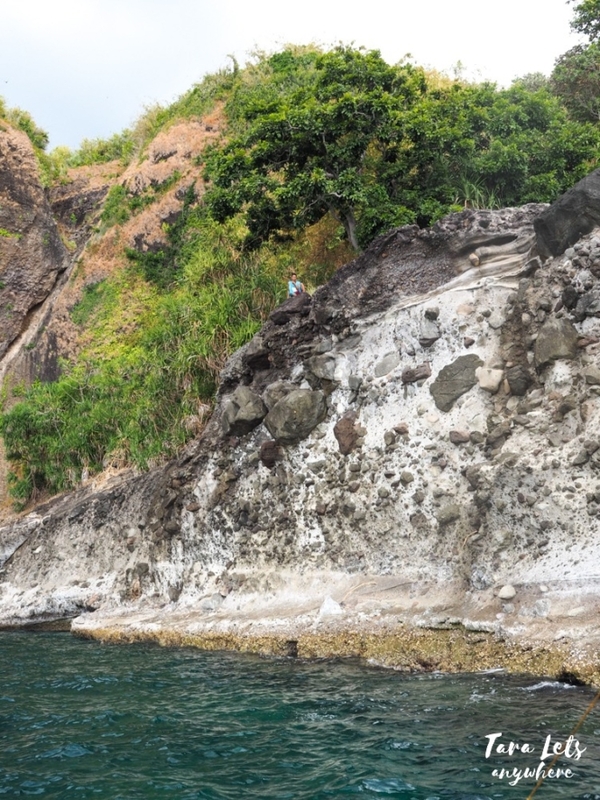 Papaya Island is one of the several islands you can visit in Nasugbu, Batangas. Currently, it’s still an off-radar location, although it’s starting to make a name for itself especially for groups who are looking for easy beach options. Since we were on a day trip, our van picked us up early in the morning in Manila and we traveled for about 1.5 hour to Nasugbu, Batangas. We got past Kaybiang Tunnel and stopped in the quarry, an area with signages for boat services going to Patungan Island or Papaya Island. We boarded a boat to reach the island. After 20 minutes, a long shore lined with coconut trees, homey cottages and camping tents greeted us. The beach has a nice green color and reflects the forest growth in the island. What you have to know about Papaya Island is that it’s a residential island set up with facilities for tourist beach-goers. 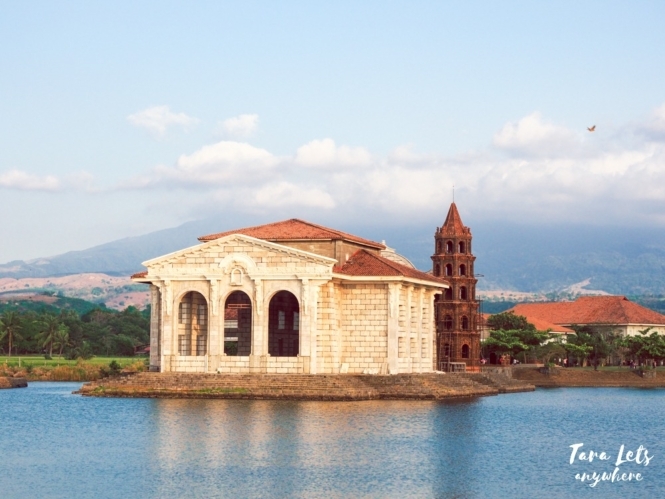 It hosts about 50 local families, and as such, you can find a variety of accommodation depending on your preferred comfort and budget, as well as sari-sari stores and food stalls. I can say that it represents your typical beach, except that it’s less crowded and gives you the feeling of having to set foot on a virgin-ish location. Papaya Island Cove in Nasugbu, Batangas. We had an outdoor cottage where we could leave our bags and rest. There was also an option to rent a closed cottage to secure our things. We had a quick breakfast and then proceeded to our island hopping tour. 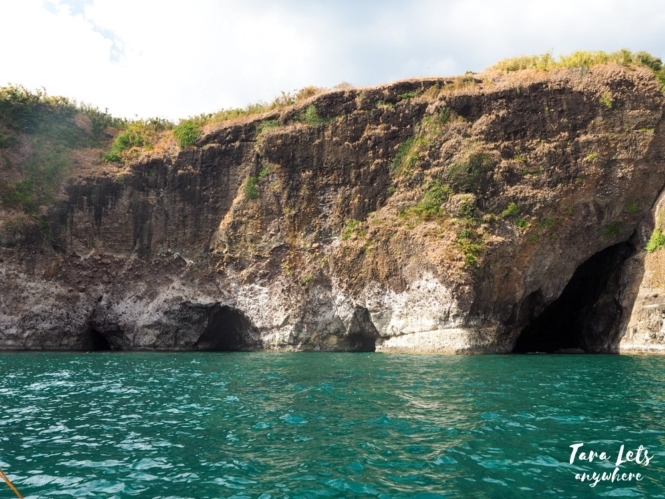 When you’re in Papaya Island, one of the things you shouldn’t miss is island hopping. 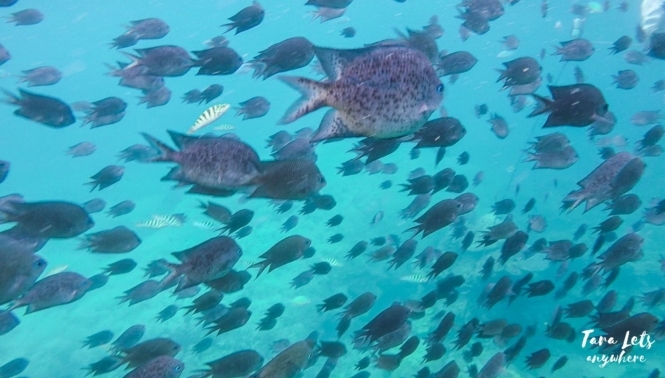 An island hopping tour typically lasts 3-4 hours. Itinerary may vary, so ask your tour organizer or boatman to confirm what are the places included in the tour. As for us, we were set to stop on 3 locations. We passed by several islands, including Mother Elephant Cove and Baby Elephant Cove, which have funny island shapes. We stopped by Santelmo Cove, which is a marine sanctuary. Locals simply call it fish feeding area. 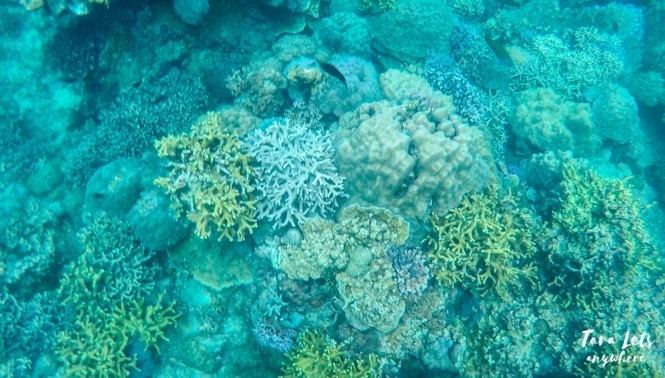 This is a great snorkeling area where you can see giant schools of fish swimming about, giant clams with pearls (if you know how to freedive) and various types of corals. This place is something everyone would enjoy. We fed the fishes bits of crackers and bread, and they would come at us. It was fun and fascinating to see them swarm up to us. As I said before, in most places feeding is not practiced to prevent the fishes from being reliant on humans, but our guide said that the fishes here are already used to being fed since it was how they were propagated by the government for 2 years. Santelmo Cove was my favorite in our island hopping trip. 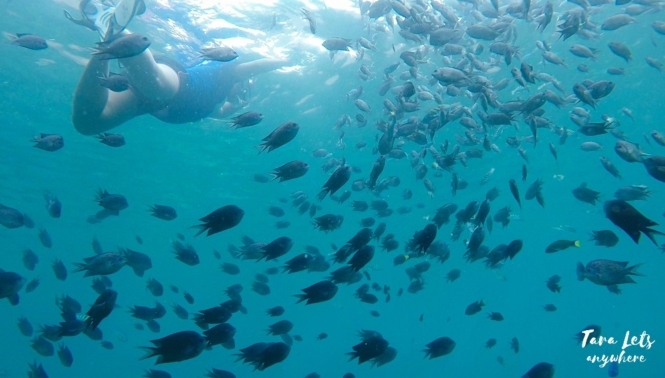 Make sure to bring your action camera here for beautiful underwater photos. Santelmo Cove – fish feeding area. Our next stop was Taytayin Cove (in my past visit, it was called a cave), which is a giant arch. Tourists stop over here to swim and cliff jump. 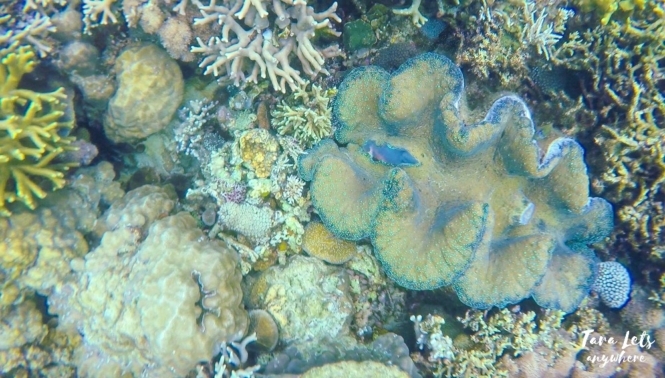 Snorkeling sights are mostly non-existent, although it’s possible to see a few corals and fishes in the water. We headed to Taytayin Beach next. The beach is a private property so we were not allowed to set foot in the shore. 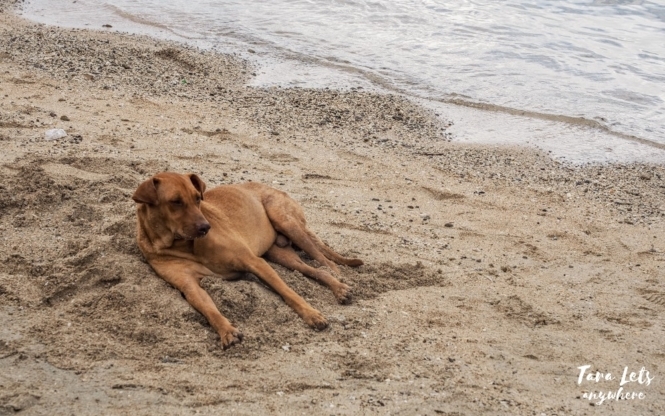 As such, we decided to move to another spot which also has a small sandy area and stayed there for a little swim. My companions who were non-swimmers appreciated this break since they could dip in shallow water. Swimming area near Taytayin Beach. The last place we went to is Mugiw Island (pronounced as bug-yo), which is an optional island hopping activity. Here there are submerged caves where bats live and a cliff where you can take pictures. Cliff diving here is possible but may be dangerous since you’d have to make a big leap to avoid hitting the rocks below. What I like about Mugiw Island is the route our boat took on the way back. We saw more submerged caves and close-up of cliffs where we could see rocks jutting out of the sediments. It’s actually interesting especially if you’re into unique rock formations. Submerged caves in Mugiw Island. In previous island hopping tours, Kabibinawan Cove is included in the itinerary but it won’t be from hereon. What I notice is that since some of the places in the island hopping tour are privately owned, the itinerary may change depending on whether outside guests will be allowed in these properties. Hence, there’s a continuing search for new locations for tourists to enjoy, such as Buguiw Island. 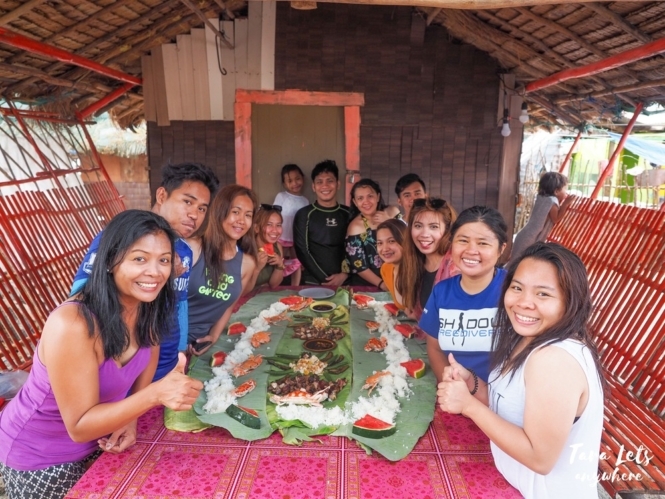 A beach trip wouldn’t be complete without a boodle fight! As per Ms. Shane, seafood is abundant and cheap in Papaya Island so seafood was also served for us during lunch. We enjoyed eating salted egg salad, grilled eggplants, pork liempo, crabs and grilled fish (not in the photo). There were slices of sweet watermelon for dessert. The boodle fight was good and it was more than enough for our group, since we had leftovers. I had 3 pieces of crab and, nope, I don’t regret it. With Ms. Shane of Biyaheros (leftmost) and our day tour group (with me wearing blue on the right). Boodle fight for lunch. Yum! The next hours during our day trip was our free time to stay and explore Papaya Island Cove. I took it as time to eat merienda since there was a stall nearby selling tusok-tusok and halo-halo. I also tried swimming on the beach. It was low tide so I settled somewhere that’s only up to my knees. There are areas covered with seaweed, but overall it’s still swimmable and even kid-friendly since children can easily navigate through the shallow water. Overall, what I can say about Papaya Island is that it may not have the blue beach we’re all looking for in Batangas, but it’s a good beach escapade nonetheless. In fact, I would say that Papaya Island has everything you want in a typical beach getaway. It has a decent beach, island hopping and snorkeling activity, various accommodations depending on your budget and more. It also offers fresh seafood which you can enjoy in your meals. A day trip here is enough for those who’re looking for a quick & affordable beach trip. For snorkelers and freedivers, an overnight stay might be more appropriate since there will be more time for water activities. I actually preferred to have stayed overnight, but unfortunately I had a commitment the following day. Papaya Island is an ideal option for barkada, family and even team outings. 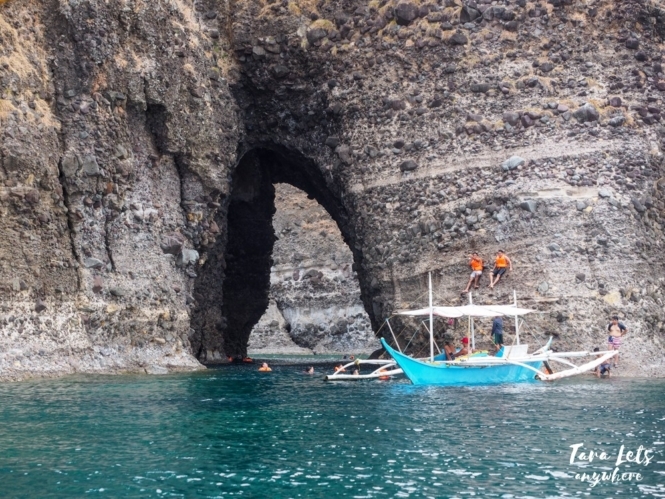 From Manila, it will take you 2 hours to reach Papaya Island. From Manila, ride a bus (Saint Anthony of Padua or Saulog Transit) en route to Ternate, Cavite. In the town proper, rent a tricycle to the Quarry or Barangay Patungan (P300 one way). From the port, board a boat headed to Papaya Island (20 minutes; locals also call it Sitio Iba Cove). There are boat services in the port. If you have already booked an accommodation in Papaya Island, boat transfer may also be included in your package. For private cars, there are parking spaces in the port (P100 overnight). For easy, hassle-free trip to Papaya Island in Nasugbu, Batangas, I recommend booking thru Biyaheros Travel and Tours. Biyaheros Travel and Tours arranges exclusive tours and joiner tours. P1299 per head, minimum 12 pax in van. 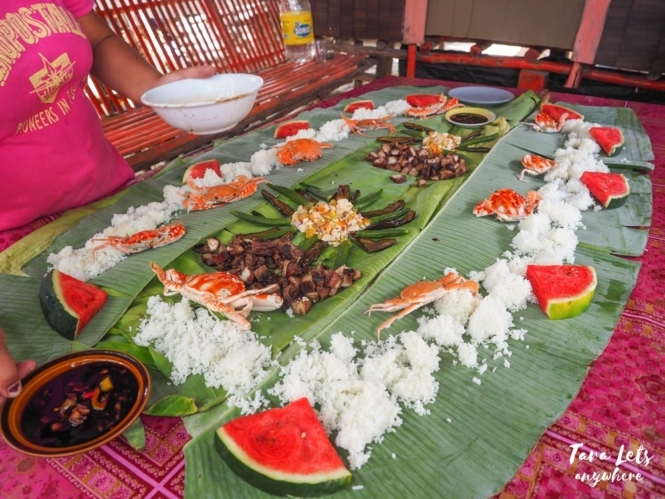 Includes round-trip transpo, island hopping and lunch (boodle fight). P1999 per head, min 12 pax in van for exclusive trip / P1799 per head, min 14 pax in van for exclusive trip / P1999, joiner rate. 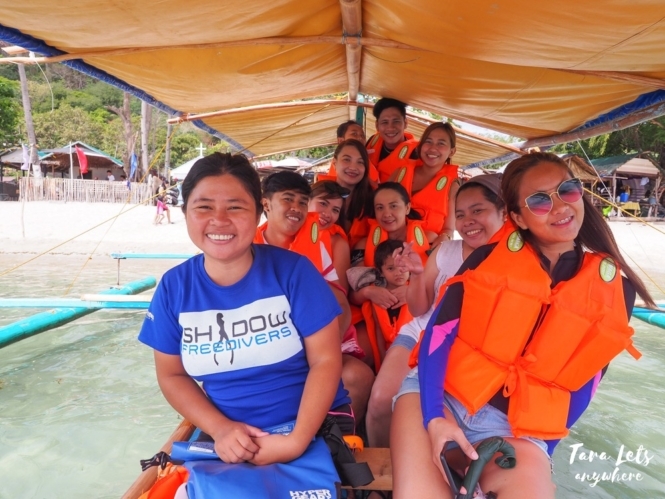 Includes round-trip transpo, island hopping, 3 hosted meals (lunch – boodle fight, dinner, breakfast), accommodation (cottage for exclusive trip, tent and open cottage for joiner trip). Island hopping is same as above. Disclaimer: Thanks Ms. Shane Iguiban of Biyaheros for inviting me! As always, all thoughts and opinions are my own. 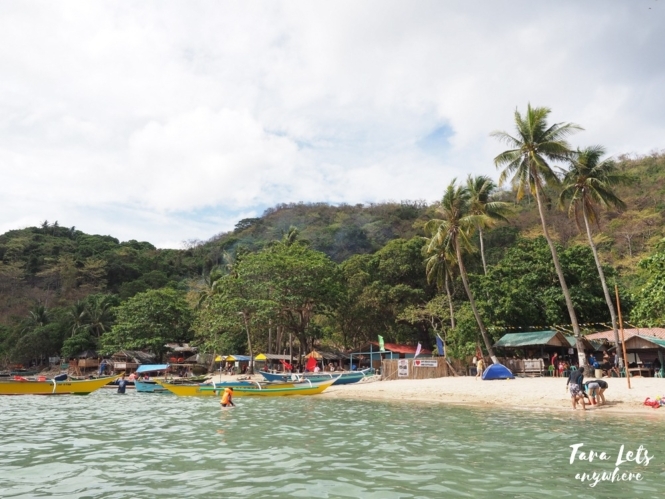 Have you been to Papaya Island in Nasugbu, Batangas? Do you have other affordable beach getaways in Batangas to recommend?